Take your performance to the next level with the Granite Nutrition Carb Cycling App! What is the Carb Cycling App? Your goal, whether it is to cut for the preseason, maintain during the season, or bulk in the off-season. The workload for the day. Whether it is a rest day, a day when you hit the iron hard, or anywhere in between this app has you covered and will adjust accordingly. You probably already know the importance of properly timing your meals around workouts but it is so time consuming sitting down to calculate and write down your meals for the day. What happens if you workout first thing in the morning one day, then in the afternoon the next? Your meal plan should change with your schedule, right? Don't worry, the Carb Cycling App will calculate your meals accordingly based on the scientific formulas of nutrient timing. All you need to do is enter what time you woke up and when you plan to workout and your meal plan will change accordingly. You can then select food items from our approved list of foods and BOOM!!! It will let you know how much to measure out to meet your macronutrient needs. We even have food items categorized as workout protein and workout carbs so you can add them to your workout drink to hit your target macronutrient intake. You don't have to painstakingly track your food anymore. No more guessing. You will know how much to eat and when to eat it. It saves time, so you get to spend more time working on that BOD and less time doing math. The Carb Cycling App is your nutrition coach in your pocket!!! In the free version it will allow you to test drive and use the app in the maintenance phase for free. You can view your meal plan and select food items to eat throughout the day but the premium features aren't available unless you UPGRADE to Carb Cycle Pro. Access to all diet phases which includes a Basic Bulk Phase, Advanced Bulk Phase, Maintenance Phase, Basic Cut Phase, and an Advanced Cut Phase. Further customization of the calculator. You will have the ability to change your preferred amount of protein and carbohydrates to consume based on your body mass. Also, you can calibrate the diet to work even better for you by adjusting total daily caloric intake. The ability to send your macronutrient and body measurement data to the Health app so you can track your progress. Download The Carb Cycling App Now!! Click one of the images below to download the app. We respect your privacy and promise not to send you a bunch of worthless, unrelated emails. Questions, Comments, or Requests? Please let us know, we would love to hear from you! With the ONE TIME purchase of the premium version, you can have a diet plan that works for you year round. 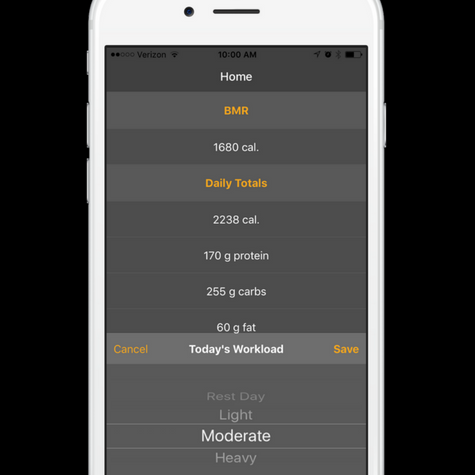 Whether you need to put on some muscle mass in the off-season, shed some fat before pre-season, or just maintain throughout the season, the Carb Cycling App has you covered. This app will let you periodize your nutrition along with your training for maximum performance. Whether today's workout is light, moderate, or heavy, the Carb Cycling app has you covered. Your daily intake will change accordingly. Oh yeah, and we've got you covered on rest days too. This will ensure you don't eat too much on rest days and don't eat too little on days where your workload is brutal. The premium version allows you to further customize the calculator. You can adjust your protein, carbohydrate, and caloric intake to suit your personal needs. Experiment with different ratios to see what works best for you. Just a note, when you adjust your caloric intake you are essentially adjusting your fat intake as well. You can set up your meal notifications to remind you to eat all of your meals but that would get kind of annoying. Or you can set it up to remind you to eat only those meals which you often forget. For instance might have trouble remembering to eat your morning or afternoon snack. All you need to do is turn on the notification for your morning and/or afternoon snack. The new meal building feature allows you to create your own custom meals. Simply select the meal you would like to build in the meal plan screen then select the food you want to eat for that meal. We even have protein and carb items to add to your workout shake and slow digesting casein protein to add to your bedtime snack. The meal plan screen is where you will see how many grams of protein, carbs, and fat you will eat for each meal throughout the day. You meal plan will change depending on when you workout in the day. This is also how you can access the new meal building feature. Mifflin-St. Jeor Calculation; this is the calculation used if you don't know what your body fat percentage is. If you do not know what your body fat percentage is DO NOT enter it and try to guess. Katch-McArdle Calculation; this is the calculation used if you do know what your body fat percentage is. Choose between metric or US Imperial units for body measurements. Choose your goal: If you want to cut, bulk, or maintain this is where you can change your goal at any time. Please note, the maintenance phase is free to use and if you would like to access all the other phases you can do so by making a one time purchase of the premium version for only $9.99 USD. The "Next" button: When you tap on the Next button it will take you directly to the Home Screen. The Settings Button: The little red gear icon in the upper right corner of your screen is the settings button. This is where you can customize the app to suit your needs. More on that later. The Send to Health App (iOS)/Fit (Android) Button: Send your body measurements to the Apple Health App (iOS) or Google Fit (Android) to track your progress. This is a premium feature included with the one time purchase. BMR is the amount of calories your body burns to support you, your organs, breathing, etc while at rest. Even when you aren't doing anything you are burning calories, which is a bonus. Your BMR will change when you lose/gain weight, get older, lose/gain body fat, and will even change with height and varies depending on your gender. Calories: This is the amount of calories you should consume throughout the day if you follow the meal plan, we call it your daily caloric need. Your daily caloric needs will change based on your BMR, the goal you chose in the profile screen, AND the workload you choose for the day, more on that later. Protein: This is the amount of protein you should consume throughout the day and it is displayed in grams (not calories). If you really want to know how may calories of protein you are eating you can multiply your grams of protein times 4, because there are roughly 4 calories per gram of protein. Your protein intake will remain constant for the most part as the only thing that should will affect protein intake is weight gain or weight loss. With the premium version you can also adjust your protein intake ratio in the app settings. Carbs: This is the amount of carbohydrates you should consume throughout the day in grams. There are also roughly 4 calories per gram of carbohydrates. Carbohydrate intake is also dependent on body weight but those ratios change based on workload as well. So, if you are planning on having a very labor-intensive day you will consume significantly more carbs than on one of your rest days. Just like with protein, you can adjust the carbohydrate ratios with the premium version. Fat: This is the amount of fat that should be eaten throughout the day in grams. Fat is different than protein and carbohydrates in that it is more nutrient dense and 1 gram of fat is roughly 9 calories. Your fat intake is what rounds out the rest of your diet. For instance let's say you need to eat 2000 calories for the day and you need to eat 170 grams of protein (680 cal. protein) and you need to eat 85 grams of carbohydrates (340 cal. carbs). This means you will need to eat 980 calories of fat (2000 total cal. - 680 cal. protein - 340 cal. carbs = 980 cal. fat) or 109 grams of fat for the day (980 fat cal. divided by 9 calories per gram of fat). The same things that affect you daily caloric needs affect your fat intake for the day. You will need to enter when you wake up and when you work out. The timing in which you eat certain meals throughout the day will change depending on when you work out in relation to when you wake up. For instance, when you work out first thing in the morning your workout drink will be consumed first thing in the morning throughout your workout, followed by your post-workout meal. But if you work out in the afternoon your workout drink will be later in the day and it will come after your pre-workout meal and it will be before your post-workout meal. Once you enter you times, your custom meal plan will be created based on these times. These are days you don't work out, therefore your calories and carbs are reduced to their lowest levels. Less than 30 total reps for lower body compound movements combined (i.e. squats, lunges, deadlifts). Less than 50 total reps for upper body compound movements combined (i.e. bench, dumbbell or barbell row, weighted pull-ups, etc). Less than 50 total reps for isolation moves (i.e. curls, leg extension, triceps extension, etc). For interval, cardio, or conditioning sessions; these workouts will typically be less than an hour and burn less than 300 calories per session. These workouts are typically greater than an hour but less than 1 1/2 hours in length. Between 30 and 60 total reps for lower body compound movements combined. Between 50 and 100 total reps for upper body compound movements combined. Between 50 and 100 total reps for isolation moves. For Interval, cardio, or conditioning sessions; these workouts will typically be more than an hour and burn more than 300 calories but less than 900 calories. These workouts are typically greater than 2 hours in length. Greater than 60 total reps for lower body compound movements combined. Greater than 100 total reps for upper body compound movements combined. Greater than 100 total reps for isolation moves. For Interval, cardio, or conditioning sessions; these workouts will typically be a couple of hours long and burn over 900 calories per session. The above guidelines are just that, guidelines. The best thing to do when figuring out workloads is to track your results and go by feel. If you are in a cutting or massing phase and aren't getting the results you want, maybe it would be a good time to re-evaluate what you consider to be a light, moderate, or heavy day. This screen is where you will go to see how your macro-nutrients are distributed for the day. There are also check boxes where you can check-off the meals you have eaten as you go through the day. Once you have finished the day you can send the macro nutrient data to the Health App (iOS users) or Google Fit (Android users) to track your progress. In this screen you can also access the meal building feature by tapping the arrows on the right side of each meal. Build your meals by selecting food items for each macronutrient category. The app will tell you how much food to measure once you click "save". You can even select your workout protein & carbs for your workout drink. Restore your purchase: this is a VERY important feature because sometimes during the purchasing process a user will lose connection with the app's network and the app won't upgrade. If this happens you can restore the purchase and get the upgraded content. Also, if you switch phones, delete the app and re-download it you will be able to restore the purchase and get the content. Adjust your caloric intake: This upgrade feature that enables you to adjust your caloric intake up or down 250 calories. This is important if you really want to dial in your diet and customize the plan to your personal needs. By adjusting calories you are essentially adjusting your daily fat intake. Adjust your protein intake: An upgrade feature in which you can adjust your daily protein intake up or down from 0.8 g/pound of body weight up to 1.2 g/pound of body weight (for metric users this is 1.8 g/kg to 2.6 g/kg). Adjust your carbohydrate intake: This upgrade feature allows you to adjust your daily carbohydrate intake based on both your body weight and workload. You will be able to set your carbohydrate intake for rest days, light, moderate, and heavy workload days. Set your meal reminders: You are able to select the meals you want to be reminded to eat. Look, you are busy and life gets away from you at times and you forget some meals more often than others. This app will allow you to select the meals you want to be reminded to eat so you aren't bogged down with notifications. Login to create an account: Logging in and creating an account saves your info to the server. Your info will never be lost, shared and you will never have to re-enter your info if you lose your phone or switch devices.